Canned food is one of life’s first and greatest conveniences and no more so than in a high volume kitchen. But you also need a can opener that is fit for the job. Quality and durability of the blade and cutting mechanism are extremely important, as poor quality blades will cease to cut cleanly after a short time and you will run the risk of contaminating your food with tiny shards of metal, known as swarf. All Bonzer® can openers are designed not to produce swarf. But your can opener is only going to perform well if it is regularly cleaned and maintained. Table top can openers are well known to EHOs as dirt traps, often because it is difficult to remove the cutting mechanism for a thorough cleaning or to change the blades. Mitchell & Cooper have surmounted this problem by fitting Bonzers® with a quick release blade carrier making it much easier to clean and change parts, the only can opener in the world to do so. 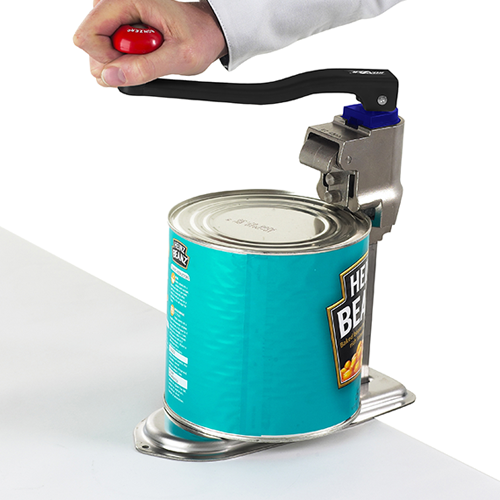 Although the name Bonzer® is often applied generically to any table top can opener, authentic Bonzers® are distinguishable by the red knob on the handle. They have been in production since the 1940’s but the design is being constantly updated to meet the demands of contemporary catering. The latest features to be added are a dishwasher friendly blade and cutting mechanism and blades with an anti-bacterial coating. *How many cans do you open a day? **What size cans do you open? For over 30 years this model has been the dependable workhorse of the kitchen. With strong and heavy construction, the Classic R combines incredible reliability and durability. Suitable for up to 10 cans per day. Removable blade carrier, Case hardened blade and wheel. 1 year warranty. A popular choice with hotels, cafes, restaurants, pubs and takeaways for hygienic, safe and efficient can opening. Suitable for up to 20 cans per day. Removable blade carrier. Case hardened blade and wheel. No manual tools needed. NSF certified. 3 year warranty, extended to 5 years. 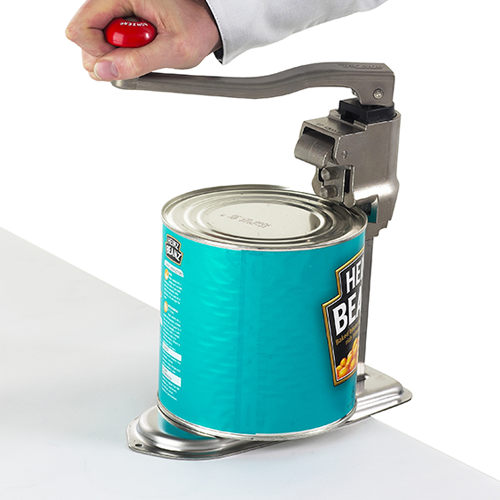 Large bench mounted can opener is ideally suited to busier kitchens opening up to 40 cans per day. With a larger 1 ½ inch wheel, the EZ-40 opens cans fast, saving both time and money. Hotels, schools, canteens, care homes and other catering establishments will benefit from this robust, hygienic and safe large can opener. Professional, heavy duty can opener has been specifically designed for large-scale catering and industrial kitchens. The EZ-60 can open any size or shape can, including oil drums, in a matter of seconds. 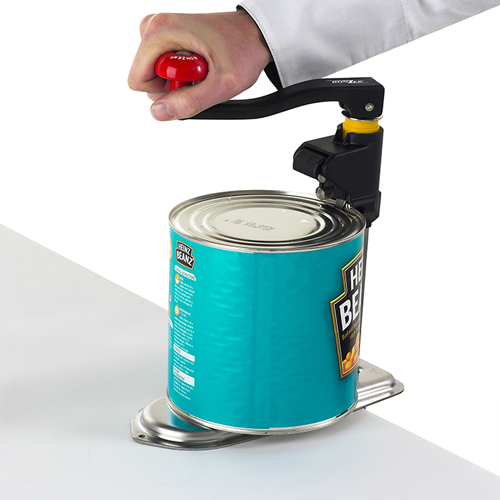 Professional caterers will see the benefits of this robust, heavy duty can opener in canteens for schools, hospitals, colleges, in-flight catering providers, the MoD, motorway service stations etc. We believe is the best manual can opener on the market today. 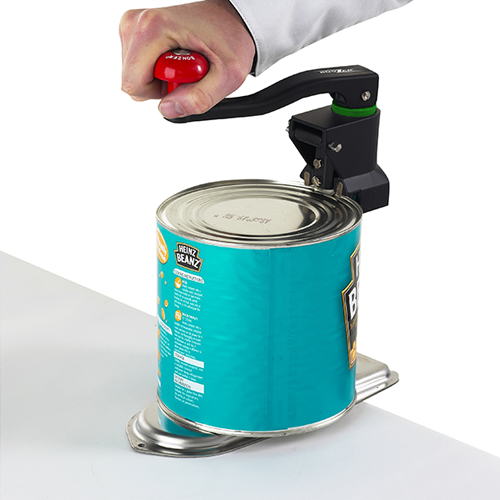 The Bonzer® Titan is ideal for large schools, hospitals, prisons, canteens, military applications, where anywhere there is a need for a robust, reliable heavy duty can opener to open a large numbers of cans each day. The Bonzer® Titan stainless can opener is suitable for opening high can volumes per day, making it a popular choice in large catering applications. Bonzer can openers combine innovative design and superior functionality to provide you with a can opener that is not only easy to install but easy to use and clean. 60 years experience and R&D. 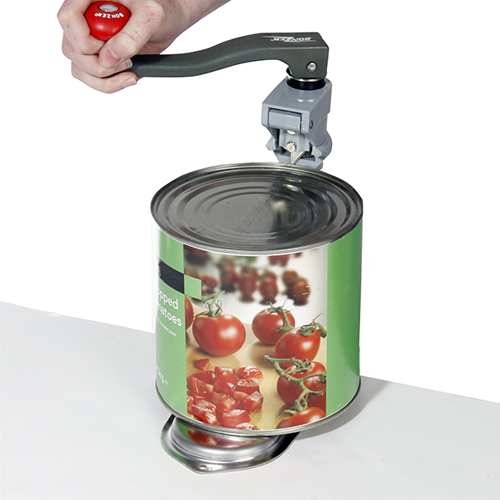 Bonzer can openers are simple to use and designed for opening all shapes and even the heaviest cans safely with ease. 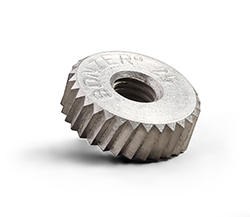 Handle length and gear wheel diameters are chosen to generate maximum rotation with minimum effort. Opens cans of all shapes ... Round, square, oblong, oval and even dented cans with ease. Choose the extra long blade for opening commercial size oil drums. Eaziclean® models feature patent design quick release blade carriers for easy cleaning and are dishwasher safe. Eaziclean® NSF Certified versions have quick release blade carriers plus stainless steel blades removable without the use of tools and are dishwasher safe.